Isolation exercises in weight training are exercises that involve only one joint and a limited number of muscle groups. This is in contrast with compound exercises that work two or more joints and more muscles. The biceps curl is an isolation exercise that flexes the elbow joint and targets the front upper arm muscles. In general, curls, raises, flys and extensions are isolation exercises. Isolation exercises allow you to focus on just one area. You can work on proper technique and load the muscle with an exact amount of weight and reps to work it to exhaustion. Gym workouts using commercial weight machines result in performing isolation exercises. It is common for a gym to have a row of exercise machines, each set up for an isolation exercise of a specific muscle group. The seat height and other adjustable settings need to be noted so the exercise is performed correctly and targets the intended muscle. A gym-goer may do a circuit training session going from machine to machine, performing one isolation exercise after another. Multi-gym machines used at home or at health clubs may also perform isolation exercises. Advanced bodybuilders may use isolation exercises to target muscles that aren't being worked well enough in their usual workouts. A person who has developed a muscle imbalance by overdeveloping one muscle group might use isolation exercises to build the opposing muscle group. Physical Therapy: Isolation exercises are often prescribed for physical therapy and rehabilitation. The therapist determines which muscles need to be strengthened after an injury, before and after joint surgery, or rehabilitation after deconditioning. A drawback doing of isolation exercises is that you need to ensure that you work the antagonist muscle for each targeted muscle. Otherwise, an imbalance can develop as one muscle group is well-developed while the opposite can't match its strength and keep body and motion aligned. A person who loves doing bicep curls and doesn't work the triceps may find themselves out of balance. In reality, no muscle moves completely isolated from the rest of the system. Synergistic muscles will also lend some assistance, stabilization or neutralization of the movement of a muscle or joint. This is especially true if the exerciser isn't using perfect form or hasn't set an exercise machine to their individual settings. If an isolation exercise is performed with too high of a weight or too many repetitions, it may result in pain or injury. Chest Fly: Done with an exercise machine or dumbbells. Works the chest muscles. Wrist Curl: Targets the forearms. Flat Bench Press: Works the chest - pectoralis major. 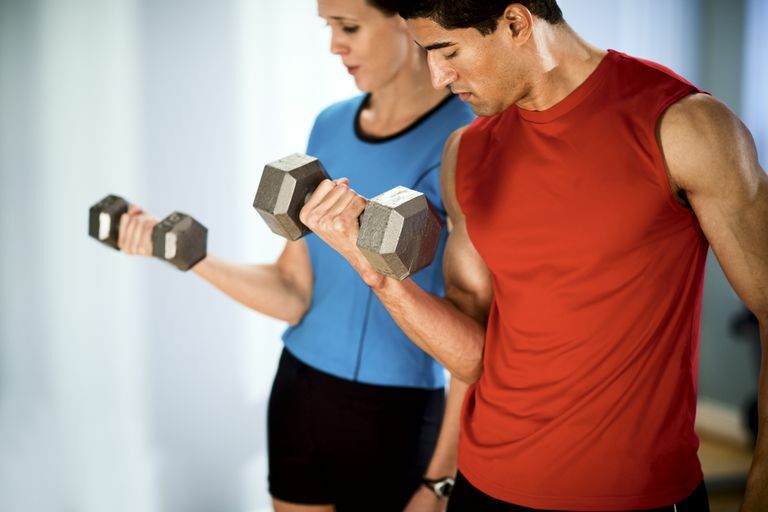 Bicep Curls: Works the biceps.Can be performed with dumbbells, cables or exercise machines. Tricep Press-Down: Cable machine. Works the triceps. Tricep Extensions: Works the triceps. Quadriceps Leg Extensions: Usually performed with a machine. Works the quadriceps. Hamstring Leg Curls:Usually performed with a seated curl machine. Works the hamstrings. Calf Raises: Works the gastrocnemius and soleus muscles of the calf. Back Extension: Works the lower back muscles. Does Walking Backward Have Any Fitness Benefits?